Surprise your loved one with either a yard full of hearts or any of our telegrams, that all include a bouquet of balloons and a song. Want to celebrate a birthday, anniversary, big promotion, new baby, relocation or send a personal message to a significant other? Need to liven up a holiday party or other event? Do you desire a gift that is anything but ordinary? 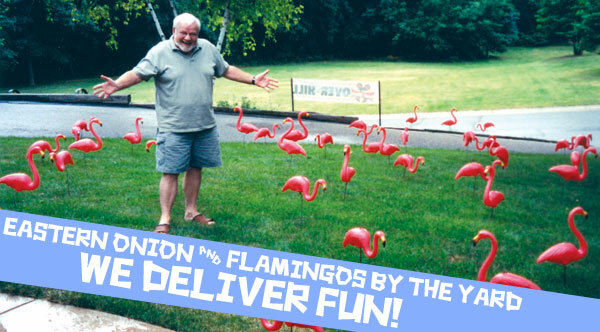 Make it more fun with a singing telegram from Eastern Onion or a Flamingos by the Yard lawn surprise. Our professional team of entertainers and lawn artists deliver to homes, offices, parties… just about anywhere within the Twin Cities area and beyond. And, though we’d prefer that you plan ahead, it’s never too late to call. Contact us today and we can probably make something happen for you tonight. Serving Minneapolis, St. Paul and all surounding areas for 30 years.